Okay…not really. But it has made buying retail really, really hard. The other day I went with my oldest daughter to our local shopping center. I haven’t owned a decent pair of shorts in years and I wanted to buy a basic pair of jean shorts. Found a pair in Banana Republic. Not a perfect fit, but not bad. Fairly comfy. Boyfriend shorts they were called with cuffs to roll up or down. Supposedly BP was having a “summer sale” but these shorts were NOT included in the sale. (It’s mid-July…what they’re waiting for!) And holy smokes with sales tax they were going to cost $75. That just frosted me. And I couldn’t do it. I thought, dang, I can get jean shorts at Goodwill for $6. Why pay $75? Not so long ago, I would have paid this. I would have moaned a bit, but would have paid it. Now I can’t. It just feels…wrong!! So I came home short-less, but eventually I’ll find a pair…hopefully before summer is over! I had better luck this morning, though not in the shorts department! I hit one yard sale and one estate sale and came away with a bounty of vintage goodies. In fact the estate sale was really a liquidation sale and the son and daughter-in-law were trying to get rid of tons of stuff for their 91-year-old mom who just moved to a senior living facility. Most stuff wasn’t marked, but they quoted reasonable prices and some I got for free!!! The Gumby is circa 1965 and still in its original (though slightly beat up) packaging. The mint-in-box Sesame Street tea set is circa 1988. 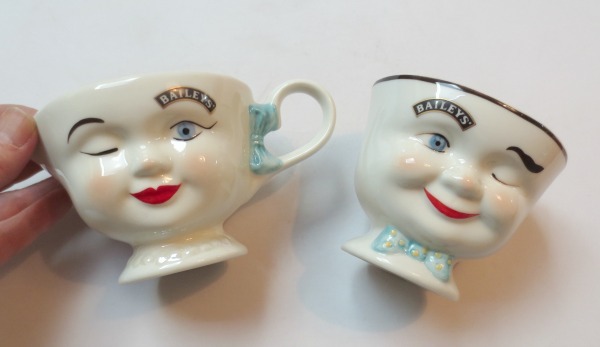 This 1996 Bailey’s Irish Cream sugar and creamer set isn’t rare or particularly valuable, but so cute! The Japanese saki cups have never been used and the little parrot vase is from Czechoslovakia. My only regret is that some of the stuff I got for free at the estate sale was because “I was giving it a good home.” I didn’t have the heart (or nerve!) to correct her and tell her that most of it would be resold in my online store. Oh well!! I know what you mean. I can’t stand retail prices anymore either, knowing how much cheaper I can get stuff thrifting. I love the parrot vase and the Japanese cups. But are they sake cups or tea cups? They look huge for sake! I am still using the 1976 husqvarna sewing machine that I taught myself to sew on. fabric was very expensive then, one daren’t make a mistake- now it’s so cheap at thrift stores that if you bugger it up, you just cut it up into something else. I just bought a 70s machine for my good friend who just turned 12 and I’m teaching him to sew-so (sew) enjoyable! Ok we can’t even pick a favourite find! Possible the sesame street set.. Very cool. Do you ever thrift online? On buy and sell apps or websites?